So many fun things afoot (apaw?) around here! Snoopy recently celebrated his 65th birthday! And MolliePup got sponsored by BarkBox! Sponsorship means that they liked her so much that they gave us a free three month subscription and a special code to share with you guys! Using code MolliePup can nab you a FREE box with any subscription. Even if you only get one box to try it out, you'll get two! 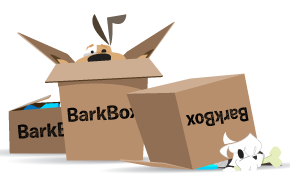 BarkBox is a monthly subscription box full of surprise treats and toys for your pup. I love a lot of things that BarkBox stands for. Their toys and treats are 100% USA made, organic and grain free whenever possible, and they donate 10% of their proceeds to shelters. Yummy, healthy treats for your pup, savings for you, a box for MolliePup, and a shelter gets a donation too. That's an all-around win if I've ever seen one! But you really want to know what's in the box, don't you? This month's theme was 'Block Pawty' and included a lot of fun treats! 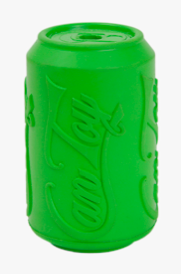 Coke Can - $11 - Sustainable, non-toxic, biodegradable and USA made toy from True Dogs LLC -Designed to be filled with peanut butter, kibble or other favorite treats. -Heavy chewer friendly. Mollie doesn't like the hard rubber toys, so she was totally uninterested in this one. :( If your dog loves to chew and can't get enough of toys like this, there's a list you can be on to only get tougher toys. I wish there was a stuffed toy only list, but alas. 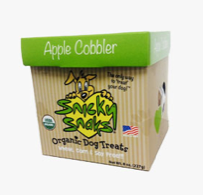 Apple Cobbler Snicky Snaks - $8 - Made from entirely USDA certified organic ingredients, these treats are the healthiest (and tasiest!) kind of cobbler around. Brought to you by Treat Planet. 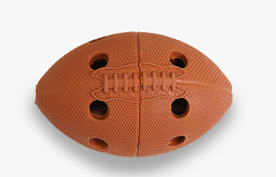 Football Tretbal - $9 - Time for a game of pigskin with your pup! Great as a treat toy and for a game of fetch or both. Measures 3" x 3" x 4.5"
She at least sniffed this one, but again she doesn't like the hard rubber toys. There's a happy ending though, my Reddit secret santa requested treat-dispensing toys for the Pet Presents swap and I happily included this and the soda can in the box for her and her two pups. 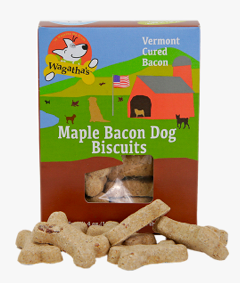 Made with organic barley flour, Vermont smoked & cured bacon, organic maple syrup, and organic cinnamon. Bacon. I mean, really. What dog (or human) doesn't like bacon? These are like a breakfast treat. Mollie and the mutts devoured this whole box in under a minute. Yum yum! This meat stick tastes ducking good! 100% American made and sourced. Ingredients: rawhide, duck, natural caramel color, salt. Great for teeth, gums and happiness. Happiness indeed. These Etta Says duck chews are one of Mollie's favorites. She pulled this out of the box first and tried to munch it with the plastic still on. She looked crushed when I took it away to take the wrapper off but then happily crunched away. Other people got other things like stuffed hot dogs, stuffed watermelon slices, and different treats. The surprise is half the fun! If you want to choose what you get to ensure you always get what you want, they do a point system that lets you do just that! If you like any of what you see in my box, you can buy them! Use code 'MolliePup' in the BarkShop and get a free bully stick with any $10 purchase! I couldn't resist having a bit of a photo shoot with her after we opened the BarkBox. We can't wait to see what comes in the September box!